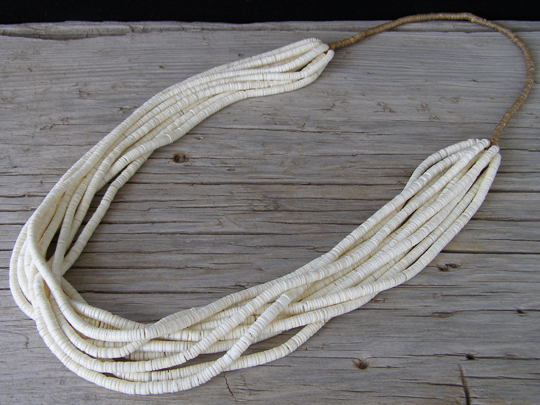 We've been buying these necklaces from Mary Coriz since the mid-nineties; originally she made these only from white clam shell or melon shell. This doesn't require much explanation or description. It's ten strands of white clam shell heishi on traditional beading string and finished off with a tight and clean traditional wrap. When you get this many strands of such lovely beads, it's pretty sumptuous. These days she makes these with a variety of beads, but the white clam shell is still the most popular. Length of Clam Shell Strands: 23 1/2"